I even got an award for commenting from ‘Crushed’ , TY crushed. Now what is that? Except maybe a fancy way of saying I like to chat? Not at all sure what to blog about. So I’ll just put what comes to mind. Almost cheating really, what do they call it? Stream of consciousness? Now I suppose I am really in this pickle because of JMB and Stainless, mostly JMB. 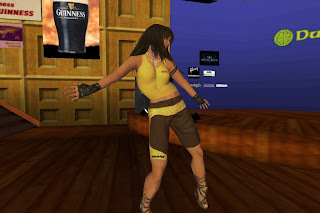 There was I, not so innocently ;-), going about my business in SL (Second Life). I am a Second Life Avatar really, and Stainless, who is a resident of Renaissance Island in SL, and is also a blogger introduced me to JMB. Note: Renaissance Island is a pretty good sim (simulation) of a generic town, or part of one, as it would have been in Tudor England, complete with a replica of the Globe theatre of Shakespeare fame. ..And yes I do know theatres developed from inns and so outside of Southwark in London there would have been very few at the time, but It is a nice replica. Worth a visit if you ever get to SL. Oh and if you don’t know, in this case an Avatar is an in world ‘body’, a virtual substitute for your body in Second Life, or other games. Your ‘character’. So… I digress. JMB and I became friends. We visit, gossip, go shopping, swap details of good stores and bargains and have been known to go dancing and hang out in bars together. Dublin has some good bars. Anyway, as anyone reading this post on JMB’s blog, and at this point I would like to thank JMB for kindly hosting my Post, will know, JMB is also a blogger. One of the things we chatted about was her blog, and blogging. I was curious, and she did invite me to look, so I visited and followed links. Naturally I was curious about her blog and others she told me about. Of course, once you visit you read… and if you are like me, occasionally just absolutely have to comment ^_^. So I got myself a blogging identity to do that. All of this had to be as my SL avatar Moggsy, as that was who JMB knew me as. I keep SL and RL (Real Life) completely separate. So now Moggsy sneaks out of SL to visit blogs ^_^. I still think this blogging may use up perfectly good time I could be spending having fun in SL, so I will have to see if this is a ‘one off’ or not. I have no master plan like Crushed. I figure I will post about whatever comes into my head, maybe SL, but there are a lot of blogs about SL out there, I googled to check ^_^. Blogs other Avies have put a lot of effort into by the looks of it. 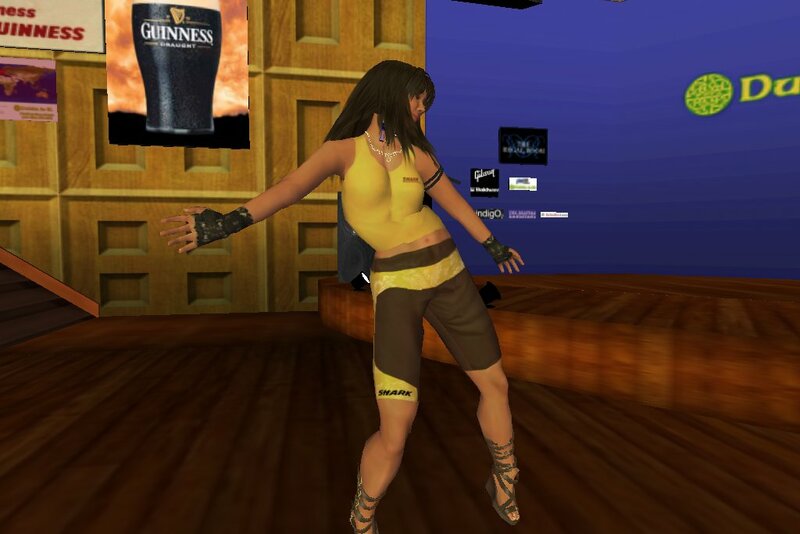 Oh and if you are curious about Second Life. It is run by Linden Labs . The program is free to download and you can join up for free, so it is totally free to go check it out. It is very flexible. You want to race cars like in a game? You can do that. You want to be in a first person shoot ‘em up game? It can do that. Like swords and sorcery, be an elf with a silver sword? It can do that. Fancy being a Vampire? You can do that. Be a gunslinger in the old west? Yes you can go there and do that. Imperial Rome? Ancient Alexandria? Tudor England? They are all out there. Hang out in the 1880’s the 1920’s, 40s, 50s? You can do that. Be a surfer dude/chick, hang out at the beach, catch a wave? You can do that too and a hundred other things. Fed up being human? Become a Neko (cat person) an animal or an alien, go live on another planet. Just remember. All the Avies you meet and interact with are people, not computer controlled. OK enough of the plugging. Here is a something that happened the other week. My friend ‘D’ called me up. So, as soon as I could, we met up and went hunting for costumes. We found a place that did quite a few outfits. We both got one, changed and got set for the ball. We turned up at the venue… and guess what? We found we were having a ‘Bridget Jones’ moment. No-one-else-there was dressed as a witch is what. “You’re way to early for the contest”, we were gently advised by people at the club. Well we figured we may as well make the best of it, stayed and enjoyed ourselves, with the occasional person admiring our outfits and helpfully telling us we had mistimed our arrival.. I couldn’t make the actual ball as it was waaay to late for me, time zones are such a nuisance. Still I have an outfit if I need one, found a good costume store, a good club, and had some fun out with a friend ^_^I guess we came out ahead. This was a week of strange happenings out there online for me, causing an endless amount of worry and loss of sleep. The first thing was the loss of a huge part of my inventory in Second Life. Now just think of one’s inventory as a big backpack that you carry around with you everywhere in Second Life, no matter where you are. It’s invisible by the way and not at all heavy. Anything you acquire is stuffed inside and you take things out and put them back as the need arises. But suddenly my backpack was almost empty. What had happened to everything? Well inventory loss does happen on occasion and there are remedies, which I discovered. First of all, clear your cache! When I discovered exactly what that meant I did it, logged off and logged back on again, expecting everything to reappear as guaranteed. Well almost guaranteed. Slowly the backpack began to fill again slowly, but then it stopped. Only 20 % of my inventory had reappeared and I did not even have a landmark to my Canadian log cabin rental home. I imagined myself homeless, forever living in the Second Life shopping malls which are open 24/7. 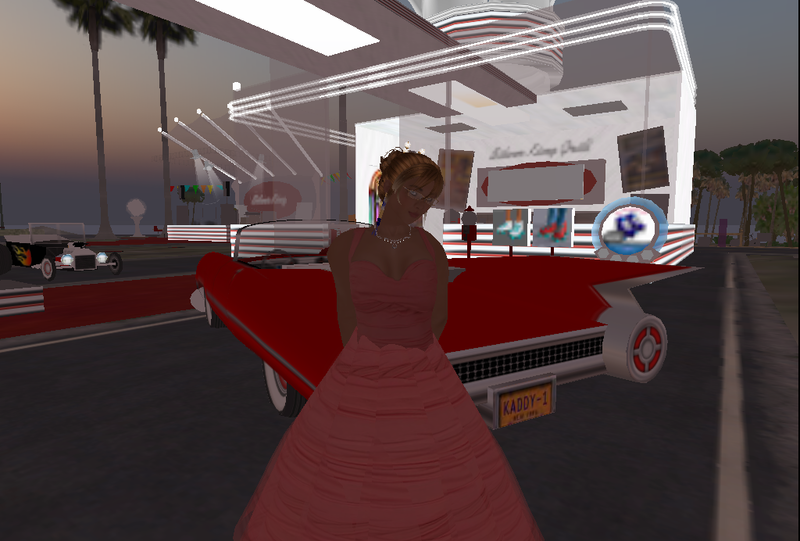 By this time it was well after midnight so my neighbour in Second Life, who lives in the UK was up and online and came to my rescue with a landmark and and all kinds of technical advice. But he said do nothing that night, for when tired one only makes errors. By this time it was almost 3am so I took his advice. At 6.30 am I was awake again and at the computer. Miraculously everything was present and correct and the crisis was over. Thank goodness. The second disaster of the week was an email from Blogger. Your blog has been has been identified as a potential spam blog. To correct this, please request a review. Your blog will be deleted within 20 days if it isn’t reviewed, and you’ll be unable to publish posts during this time. After we receive your request, we’ll review your blog and unlock it within two business days. Lovely, I was locked out of posting on my own blog. I requested a review immediately and headed to the Blogger forums where I found that I was not alone with this problem. All kinds of people were frantically seeking help and wondering why their harmless blogs had been targeted for this treatment. Now I have a WordPress blog too, Musings of Nobody Important, just a trial really. I used to post my posts there as well as on Blogger for a short while and then I became lazy. After all I had never really had any trouble with Blogger. So I backed up my blog onto my hard drive, laboriously, month by month for 2008. Then I started copying some more of the posts onto the WordPress blog, but it was hopelessly time consuming. Miraculously, twenty four hours later, I was unblocked, just in time for Photo Hunt. Another ten years taken off my life! No my hair could not possibly get any greyer! So now to the third in the trio of disasters, except this one did not really affect me directly but only indirectly. Being a night owl I was still up at 1am to receive an email from a Blogpower member in the UK, telling me that I should immediately remove Sitemeter from our blog site since it was causing the people using Internet Explorer to be unable to access blogs with sitemeter. She wanted to alert everyone to this fact. What? There were no real details and I did a quick google search but found nothing of interest and everything worked just fine with Firefox, and didn’t everyone use Firefox nowadays? Once again I decided to leave everthing till morning since it was so late. Next morning I used the dreaded IE 7 and accessed all the blogs that everyone had been having trouble with without any problem. I followed all the links that No Clue sent me and indeed it was Sitemeter causing all the problems, however everything was all fixed by the time I was able to look into it. One of the advantages of living in a different time zone so I avoided all the trouble, well since I always use Firefox it did not affect me anyway. But I did not have to go to the trouble of removing Sitemeter. I’ll bet there are some red faces in that company after this weekend. After all those problems it is nice to receive some awards this week, so forgive the long post, but I need to post these else I’ll cause offense and be run out of the blogosphere. Crushed, Mutley, Jams, Beaman, Lady Mac, James, and the enigmatic Sean. This one came to me from Nunyaa and it is a bit strange in that it seems to be passing from its original Spanish out into the English blogging world. Again no obligation. 1) You have to pick 5 blogs that you consider deserve this award, creativity, design, interesting material, and also contributes to the blogger community, no matter what language. This wonderful “BFF” Gold Card has been passed on to me by Mary, the Teach of Work of a Poet. Thank you, Mary, you are indeed a Best/Blogging Friend Forever! I’m going to choose some of the lady bloggers from Blogpower where we are very much outnumbered by the men, but we do lend each other support and friendship. Sorry all old friends but all in another part of the world from me! I never did follow the rules that strictly anyway. So Welshcakes, Liz, Sally, Ellee and Lady Mac with a couple of spares in Nunyaa and Cherrypie. Last but not least, the Blogpower roundup by Chervil is up. Enjoy. I was tagged with the meme, Seven Good Things in Life, by fellow Blogpower member, Grendel whose own answers included the wonderful word trencherdom, which greatly tickled my fancy. I think he made it up, but, as I said in a recent post, trencherman is a word that I use on occasion, so I was happy to see that I was not the only one who appreciates it. 1. Chocolate. What can I say? I’ve written before about it being the Achilles’ heel of JMB. But I’ve given it up for Lent. I gave it up for Advent too and in between Christmas and Lent. In fact I’m abstaining from it totally for a while. But I can taste it on my tongue, just writing about it, wonderful dark bitter chocolate. Hi, I’m JMB and I’m a chocoholic. 2. Books. A great book by the fire on a rainy day. Books are my passion. Bookstores are my passion. Libraries are my passion. Yes, I own a lot of books. Thousands. I guess I’m a bookaholic too, but there’s no way I’m giving them up! 3. Dogs. Nothing is more wonderful than a doggy companion. Sadly I don’t have a dog any more. 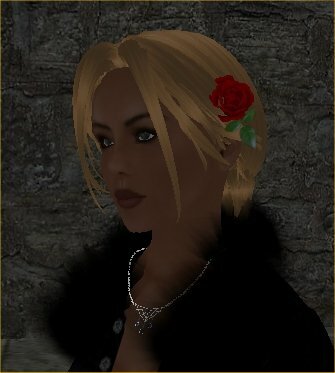 My last one, Cleo, the Westie of my avatar, was not replaced. Owning a dog is a fifteen year commitment and I may not have fifteen years on my horizon, so we decided not to get another. Well one of us did. Guess which one? 4. The techie toys. My laptop, my iPod, my Palm PDA, my cell phone. I do love these things that make my life more challenging as well as more interesting. Frustrating too sometimes. 5. Friends. Nothing is more enjoyable than activities shared with friends. My friends and I have a lot of fun and share many laughs. We care about each other and we can count on each other. What more could one ask? 6. A great meal. Preferably cooked by someone other than me. Preferably at least three courses, with a spectacular dessert to finish. Preferably shared with good company. The most perfect meal I have ever eaten was in 1988, at Chinon, France, with my daughter and husband, at a place called La Gargantua. We were just walking by and saw this restaurant in an outdoor courtyard, enclosed by a stone wall, and it looked so pleasant and inviting we went right in. The food was amazing, it was a beautiful evening and an all-around memorable experience. 7. Family, last but not least. Especially my four year old granddaughter. I had to wait a long time to become a grandmother, until I was 68. For years I had nothing to contribute to conversations about grandchildren. Even though she lives on the East Coast of the USA, luckily with the techie toys, I have been able to share in her life, thanks to Skype and my webcam and the video that her father faithfully emails both sets of distant grandparents every day. I won’t tag people specifically but anyone who reads this post is welcome to take up the meme if it appeals to you. This came to me from Mary, the Teach, at Work of the Poet, who created the award and being the literary person she is, found the perfect quotation to go with it. Many thanks to you Mary for this, it is quite an honour, coming from you. There are so many people to whom I could pass this award, however if you read here feel free to accept this award, for my regular readers and commenters all light up my life. One person I will name, although I know she will not accept or pass it on, but she brings light into the world with her precious words, the words of a poet, along with her photos and paintings. After a hiatus, Janice Thomson of Drinking the Moon is back, delighting her readers once more. Why don’t you pass by and see what she has to offer. You won’t regret it. Something I want to bring to your attention in my sidebar is the new format of the MyBlogLog widget. Eyes right! Isn’t it the neatest thing? I haven’t seen it in anyone else’s sidebar yet, so I am thinking that maybe few know about it. Temporarily I have the new one, with small avatars to fit more in, and the old at the top of the sidebar so you can compare. I have the MyBlogLog blog on my bloglines feed, so in a new post I discovered that they had reworked the widget to give this very splashy one. You can change the colours of the display and the size of the avatar and you can set up the number of avatars to show quite easily, with the maximum number of rows being 10. After you have tweeked it to your liking, you take the code and insert into the sidebar. The really neat thing about it is that when you hover your mouse over the avatar a window opens with a little more information about the visitor. Check it out on mine and go play yourself. I think you will like it, especially if previously you did not know how to increase the number of avatars displayed. Luckily a blog friend helped me with that on the old widget but now anyone can do it easily. No unfortunately, no money changed hands for this testimonial. Every now and again someone will present me with an award and I thank them and think to post it later. Sometimes, well quite often actually, I forget and I am really bad because I often don’t pass them on. I had a piece of paper by the computer with a couple written down but it seems to have disappeared. I’m not so good with memes either, usually only doing the ones that appeal to me. So this is also a bit of a catch-up post of a couple of recent ones. This one above came to me via Ian at Failure is the Key to Success, one of my first commenters, just over a year ago. Thank you so much Ian, I do appreciate it. Acceptance is conditional on passing it on to 10 more people. I’m going to pick some of my medblog reads so I don’t think the award will be going much farther down that road. Still they are all excellent reads. Dr Rob, wild and crazy pediatrician and internist; Dr Schwab, surgeon extraordinaire; Ex Utero, neonatologist and excellent writer; Grunt Doc, maverick ER doc; Shadowfax, another ER doc; Suture for a Living, all you ever wanted to know about plastic surgery and quilting; Dr Val, online doctor at revolutionhealth.com; No 1 Dino, solo practitioner and he of the three cardinal rules of blogging; other things amanzi, surgeon in South Africa with tales to tell; and finally Brainhell, ALS patient who died recently but left a magnificent written legacy of that journey. Liz of Finding Life Hard? gave me the Nice Matters Award. Thank you so much Liz, who seems very nice from what I see in her blog and she passed it to some other nice people but nice is an adjective I don’t think about in regards to myself. Oh I try, quite unsuccessfully it seems to me. Maybe I’ll have to try harder in the future to live up to this award. If you gave me an award and I did not post it, I do apologize. Put it down to the old lady being a bit forgetful now and again and losing her piece of paper. 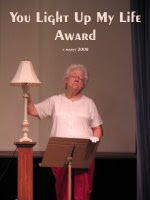 Leslie of the Pedalogue was kind enough to pass this award on to me and said some very kind words about me and this blog for which I thank her. Leslie is a local blogger and one day we’ll get together.